Figure 438. Tape Emulator module. The Tape Emulator module emulates the sonic characteristics of analog tape recordings, and provides extensive control with adjustable tape speed, bias and noise parameters. Digital audio is often accused of lacking “character”. Although mixing entirely inside a computer has many benefits, it can sometimes lack the character of using an analog mixing console and analog magnetic tape. Digital audio can capture audio levels up to 0 dB before undesirable clipping occurs. This is known as overload. Analog tape recordings also have an upper limit, but unlike digital clipping, the signal compresses and distorts slightly as you approach the limit. There is typically a “sweet spot” of a few decibels before undesirable distortion occurs. Because tape saturation sounds pleasing to most people, recording engineers have long been using it as a creative mixing tool. The Tape Emulator module lets you add the analog warmth and richness of magnetic tape saturation to your digital mixes. Use it on individual mono or stereo tracks, or on buses. Unlike real analog tape, the Tape Emulator gives you the flexibility of applying tape saturation to individual tracks, and only where desired. For example, you may want to apply heavy tape saturation to drums, a little less to bass guitar, but not to vocals, etc. Tape saturation occurs when you try to record too loud and varying signal levels onto magnetic tape for it to accurately reproduce, whereby the input signal is no longer directly proportional to the recorded signal. During playback, the tape reproduces less energy than was originally there, which is the saturation effect. Recording engineers often experience this as a result of trying to record a signal that is loud enough to overcome ever-present tape hiss. Unlike digital distortion, analog tape saturation can sound pleasing in the right situations, especially on drums. Tape saturation adds subtle non-linear distortion, compression and EQ, which can add grittiness and bottom end to your tracks. This is often perceived as “punch” and “warmth”. Clipping LED. 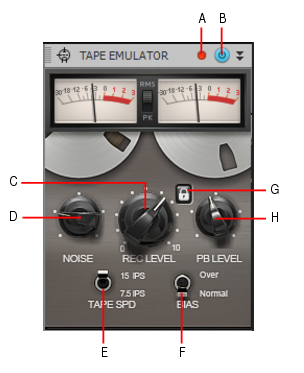 Shows if the input signal to the Tape Emulator module is clipping. If there is any distortion in the ProChannel signal chain, the clipping LEDs let you identify where the clipping occurs. Tape Emulator enable/disable . Enables/disables the Tape Emulator module. Rec Level. Applies a gain adjustment to the pre-processed audio signal (input level). Higher values cause increased compression/saturation. PB Level. Applies a final gain adjustment to the post-processed audio signal (output level). 7.5 INS. Represents a slow tape speed, which has a more compressed and warm tone, lacking of high frequencies. 15 INS. Represents a standard tape speed, and causes faster compression attack times. Over. Reduces distortion in the low and mid frequency range, particularly on sibilant sounds, and interacts with the Noise level. Normal. Represents a standard level of distortion. Link. When Link is enabled, the Rec Level and PB Level knobs are linked to help maintain unity gain. When disabled, the Rec Level and PB Level knobs can be operated independently.